If you want to grow your service business faster, you have to sell more! Do ALL solution sales staff sell first-year service contracts with new sales? Do ALL technicians proactively recommend add-ons, spare and wear parts, consumables? Do you have enough dedicated sales staff to up-sell the customer base? We assume that you have a lot of installed equipment out there and you have the capability to serve them and other similar products. Even without knowing anything about your specific situation, it is likely that your installed base is not fully reaching its services, spare and wear parts business potential. Far from all your customers have regularly paid service contracts. Very few of your customers are buying high-value services (optimization, operation …) and few similar third-party and competitor equipment are covered by your services. A great service growth potential exists. It typically is several times the size of your service business of today. It also likely that you make several hundred times more sales efforts on the service side compared to your product/solution sales with much smaller individual sales during the whole life of the equipment. Some of the services sold are significant but most of them are very small. Therefore, the whole organisation has to be leveraged. You can’t send a sales rep to a customer just to sell $500 worth of consumables or wear part. Just the travel and meeting time eats up the profit of the deal. Having a technician spend an extra 15 minutes on-site to make these kinds of sales helps secure this type of business and makes it very profitable. In strong service sales companies 80-90% of the service sales staff are not dedicated service sales people; they have other core professions like service management, service help desk, site visiting technicians, in-house spare part order takers, product sales and so on, and they need a lot of support to become successful in their service sales work. One challenge for many central service functions is to move from supporting front line organisations with the HQ-developed service portfolio to getting much closer to understanding and supporting the global service sales organisation in an optimal way. Companies that are successful in service sales, develop and implement company-wide best practices supporting these roles to do a better sales job. 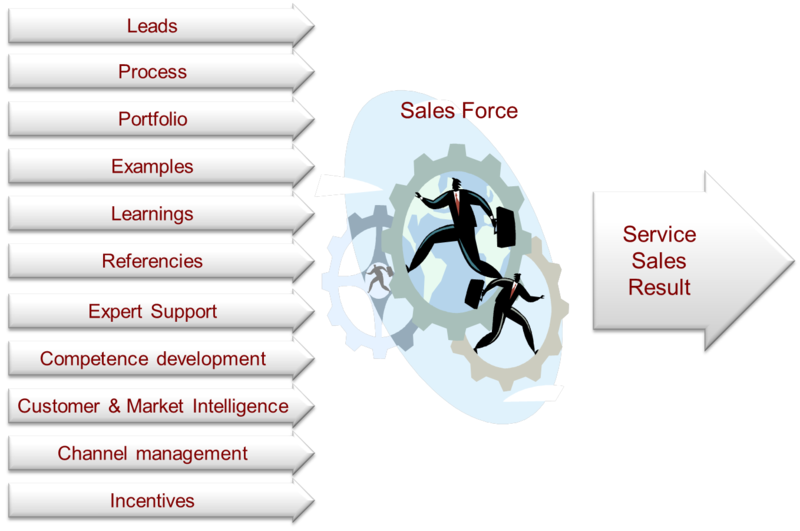 The reason why companies can always improve service sales is because service sales spans so many different areas and it is very difficult to be the best in all of them. For you, these projects are probably one off changes, e.g. once you have successfully begun selling services using product/solution sales at the time of new sales, you never need to make this change again. This means there is limited in-house experience from similar projects and no arguments in acquiring it yourself. We have been developing service businesses all our lives. It is our core competence. We have experience from managing design and implementation of add-on sales solutions in large technician organisations, adding third parties and competitors’ equipment to the scope of service offerings, developing high value solutions in service portfolios and implementing them in large organisations, implementing 100% attached services to all sold products, and improving global skills in up-sales of service contracts. We have executed many projects focused on introducing new service offerings into the sales force. We have consolidated all our findings, avoiding all known pitfalls to benefit our customers. We represent a unique consolidated experience in how to sell more services. If you want to establish a service sales strategy for service sales development planning over the coming years, we are happy to provide our recommendations. Successful service sales need good service offers. We will gladly assist you in benefiting from our experience in service portfolio development. … or if you want to manage the growth yourself, we will happily share our knowledge with you in the specific area that you want, all with the goal of making you more successful. We will support You finding the optimal mix of your in-house expertise and our expertise in service sales development. 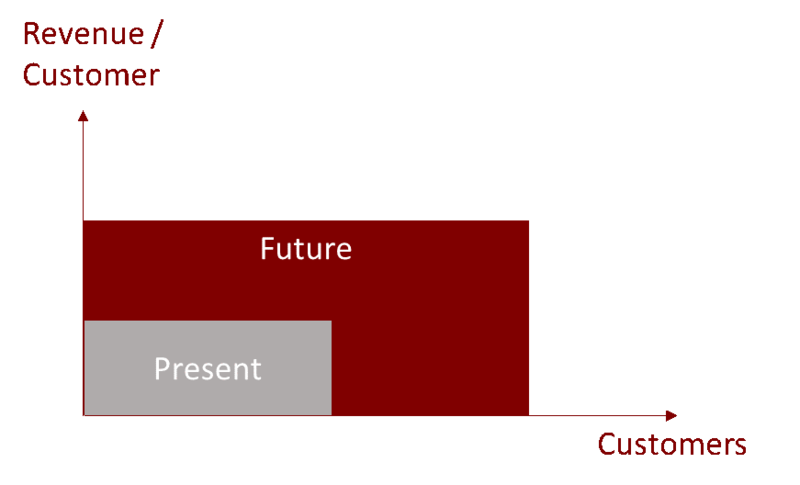 If you do not address the service sales opportunity strongly, you risk competitors “eating your cake”. Others will become stronger in serving your equipment and, after a while, your most profitable business will be substantially degraded.